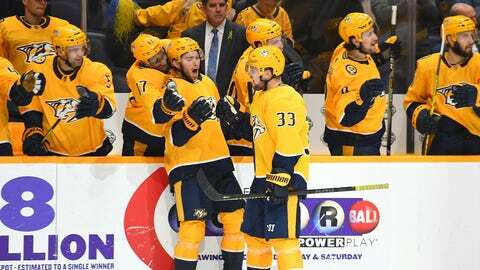 NASHVILLE – FOX Sports Tennessee will televise the Nashville Predators during the First Round of the 2019 Stanley Cup Playoffs, along with Predators LIVE Playoffs Edition before and after each telecast on the network. Additionally, Predators LIVE postgame shows will air after every Predators playoff game through the postseason. The Predators will open the First Round against the Dallas Stars on Wednesday, April 10, on FOX Sports Tennessee. Coverage will begin with Predators LIVE at 8:00 p.m. CT. Channel listings can be found here. Every Predators playoff game televised on the network can be streamed live via the free FOX Sports GO app for all subscribers of participating video providers. For more information, visit FOXSportsGO.com. Game 1 Wednesday, April 10 vs. Dallas Stars 8 p.m. 8:30 p.m. 11:00 p.m.
Game 2 Saturday, April 13 vs. Dallas Stars 4:30 p.m. 5 p.m. 7:30 p.m.
Game 3 Monday, April 15 at Dallas Stars 8 p.m. 8:30 p.m. 11:00 p.m.
Game 4 Wednesday, April 17 at Dallas Stars 6:30 p.m. 7 p.m. 9:30 p.m.
*If necessary || Television schedule subject to change. Play-by-play announcer Willy Daunic (@WillyD1025) and analyst Chris Mason (@cmace30) will call the action during First Round games on FOX Sports Tennessee with Kara Hammer (@KaraHammer) and Lyndsay Rowley (@LyndsayRowley) providing interviews and in-game reports. Rowley will host Predators LIVE throughout the entirety of the postseason alongside analyst Terry Crisp (@ZenofTerryCrisp). The network will deliver extensive digital content during the playoffs on Facebook, Instagram and Twitter.